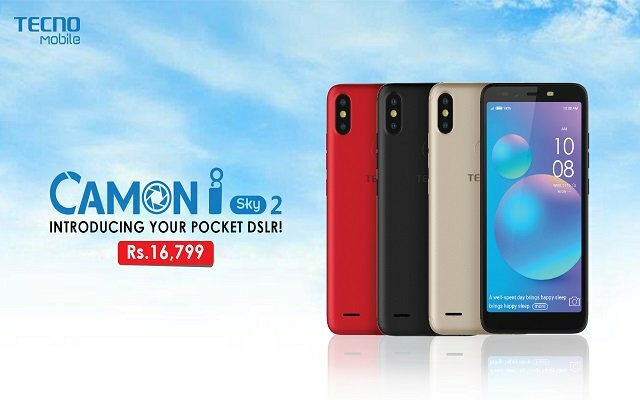 TECNO Mobile launched its much anticipated and latest addition to the successful CAMON series, the CAMON i SKY2, across Pakistan. The CAMON i SKY2 is the first-of-its-kind budget smartphone to offer a 13MP AI Selfie camera, an AI 13MP+VGA Dual Rear Camera, 5.5” HD+ 2.5D curved display, Face Recognition, Fingerprint Sensor, and 3050 mAh battery. Effectively making the CAMON i SKY2 the first budget smartphone in Pakistan to offer such high-end features for an incredibly affordable price of PKR 16,799. Making its mark when it comes to exemplary customer care as well, TECNO Mobile is also providing 100 days’ free replacement and 1-month extended warranty. “The youth of today has created a large demand for camera phones in the market however a void is left behind due to the fact that capable photography features come caged with high price tags.” Said General Manager, TECNO Mobile Pakistan Stephen HA. The rear camera offers an innovative Dual Camera setup with a 13MP Primary Camera and VGA Secondary Camera for focus. It also utilizes AI integrations to offer Auto Scenes Detection and better, smarter lighting as well. The CAMON i SKY2 also offers the option of long pressing the capture button to take 20 successive photos in 3.5 seconds when you don’t want to miss even a single moment. With a Full view 5.5” IPS HD+ display with 1440 x 720 resolution and 18:9 ratio, the CAMON i SKY2 will enable you to immerse yourself in a viewing experience that allows you to see better and brighter on a bigger screen. Decidedly bringing the best technology at the best price, the CAMON i SKY2 further seals the deal in terms of looks with three elegant colors – Bordeaux Red, Champagne Gold, and Midnight Black.